It isn’t easy being a bird. There are plenty of predators out there and adding your cat to the mix isn’t a good idea. This past summer my tiny yard turned into a veritable bird nursery with nests of cardinals, catbirds, purple finches, chickadees and robins in trees and shrubs, even the climbing rose. It was really quite phenomenal. Never before have there been so many baby birds hopping around. Apparently I wasn’t the only one who noticed all the avian activity. Early one foggy morning a drama played out as a small hawk (I have no idea what kind it was) swooped down and snatched a recently-fledged baby robin. The parents were frantic, chasing the hawk and squawking in their distress. It was traumatic to watch, but that hawk no doubt had young to feed too. It was just Nature at work. That hawk would only take what it needed to survive. But what clearly wasn’t Nature at work was when the neighbor’s cat caught the robins’ second and last fledgling. The two babies had been the result of the birds’ second nest. The first one was raided early, probably by crows. One day the mother bird was sitting on her nest, and the next the ground nearby was littered with bits of incredibly blue egg shells, and the nest was ominously empty. 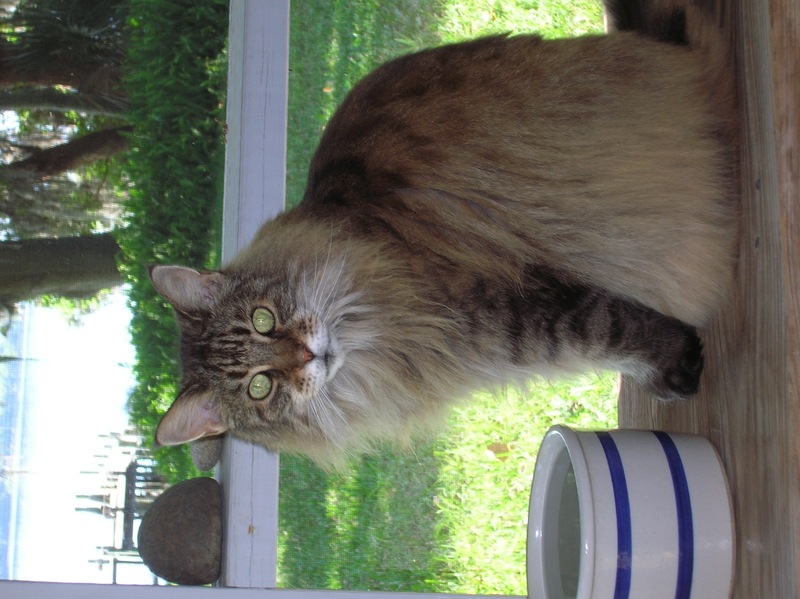 Edna loves her big bowl of water, placed on a screened porch. Perfectly happy, Edna is a senior citizen who has lived indoors all her life. I am very fond of cats. I have a cat, who I love very much, She is a wonderful cat. Cats in gardens certainly make for a romantic pair. But don’t be fooled. As much as she’d like to, my cat isn’t allowed outside. Actually she did get out on a couple of occasions, and each time within a minute or two came proudly trotting back to the door with a small dead animal in her perfectly pointed little white teeth. She thought she was doing something wonderful. In cat terms she was. She was doing what cats do. It is precisely because she is such an efficient hunter that she does not go outside. All the neighborhood cats are prolific hunters. You might not think your cat kills things, but it does. I’ve heard all the excuses. “My cat just LOVES to be outdoors, I couldn’t deny her/him.” “My cat is only killing the weak and helpless animals.” “My cat’s hunting is just natural, a part of Nature.” None of that is true. Period. The truth is that cats are very well-fed and very efficient predators that are not, I repeat NOT a part of Nature. In fact, they are an un-natural predator that many songbirds and other small animals have not evolved to defend themselves against. There are lots of natural predators out there—birds of prey like that hawk, foxes, coyotes, snakes, skunks, raccoons, bobcats and so on that catch and kill things to survive. Don’t you think it is difficult enough for a robin, a cardinal or wren or hummingbird for example, to raise a clutch of young’uns with all those natural predators out there that adding a cat to the mix is just too much? I’m not talking about working cats here, farm cats whose job is to keep the mice populations down. What I am referring to are all those city cats, even some of those country cats who hunt for sport. I have watched “your” cat sitting among low foliage in my flower flower bed. In the springtime the hummingbirds cannot resist those little pink flowers that are about six inches off the ground. “Your” cat has no trouble whatsoever snatching those hummingbirds right out of the air as they come in to sip the nectar from those blooms. Then as soon as “your” cat has killed that hummingbird it gets itself in position to get another. Unlike all those natural predators out there, “your” cat doesn’t need to catch those hummingbirds to survive. And those weren’t weak or sick hummingbirds. They were just doing what hummingbirds do, feeding themselves and their young. “Your” cat is just doing what all cats do, and if you’ve ever watched what a cat does with some hapless animal it has caught, the notion of a quick kill just isn’t part of that picture. Guilty as sin, and he knows it! This cat has been “harvesting” hummingbirds, just for the fun of it. Keeping your cat indoors helps wildlife and makes for a healthier cat too. Keeping your cat indoors—all the time—would do those hummingbirds (robins or wrens or cardinals or whatever) a big favor. It would do a lot of small wildlife a big favor, as well the rest of us who like to see the birds at the feeders and flowers too. There’s a good reason those felines are called “house cats.” Wildlife enhances our enjoyment of our gardens, and our gardens can be welcoming environments for many species. Okay, if that isn’t reason enough for you to keep your cat indoors—all the time—then consider this. Outdoor cats live an average of three years. That’s it, three. My beloved cat, Edna, is 16 years young. Chances are an outdoor cat will never reach that age. The cat that goes outside is likely to get hit by a car, or attacked by any number of those same predators I already mentioned or some I haven’t, or another bigger, stronger cat, or a dog. If an encounter with one of those doesn’t kill the outdoor cat, it could well mean an expensive trip to the veterinarian’s office. Plus there are fleas, ticks and all sorts of diseases that an indoor cat avoids. I know it looks pretty grand in the garden, and it certainly enjoys a snooze in a sunny spot among those fall leaves, but if you care about your cat, you will keep it indoors—all the time. Think about it. The wildlife will thank you and so will I. Cats have been domesticated animals for thousands of years, and most have no problem being “house cats” for their entire lives. The easiest way to have a happy indoor cat is to start one out that way, by not allowing “Kitty” to go outdoors. But not everyone has that luxury. Morphing an outdoor cat into an indoor cat can be a challenge, and for a variety of reasons some cats may never make that transition. An outdoor enclosure might the solution for that cat. • From kittenhood on, keep the cat indoors. The cat won’t miss what it doesn’t know. • Keep doors closed. An open door is an invitation to the outdoors. • If “Kitty” keeps trying to “escape” when a door is opened, plan for it by placing someone outside the door with a couple trash can lids to bang together to discourage the cat from going outdoors. • Use a water-filled spray bottle to spritz Kitty and issue a firm “NO” whenever an “escape” is attempted through an open door. • Provide a “window” to the outdoors, a perch at a window or access to a screened porch, sliding glass door or enclosed outdoor area to keep an indoor cat entertained. • Supply an indoor garden of cat “greens” which help in digestion. • Grow a pot of catnip. This healthful herb is actually good for cats, makes them happy and relaxed. Let “Kitty” graze from the fresh herb, instead of your houseplants. • Most cats love water. An extra water bowl is a real treat for indoor cats. Position one near a screened window or sliding glass door for a welcoming kitty retreat. • Keep “Kitty’s” litter box clean. This is one tactic that solves a lot of indoor cat problems.